The West Benton Firefighters’ Association consists of both paid and volunteer members of the West Benton Regional Fire Authority (DBA West Benton Fire Rescue) who volunteer their time to raise money and participate in community events. Funding for the Association comes from water bottle sales, our annual Biscuits & Gravy fundraiser, private donations, and various community events. The West Benton Firefighters’ Association uses these funds to assist West Benton Fire Rescue with the purchase of equipment and other department needs. Additionally, the association gifts college scholarships to graduating Prosser seniors and donates to various community organizations. 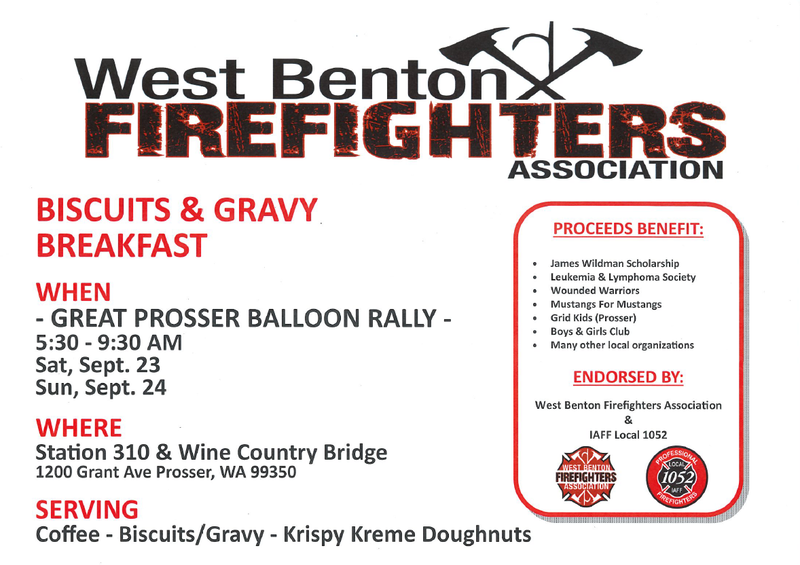 The West Benton Firefighters’ Association would like to thank the Prosser community for their generous support over the years. With the continued support of the community we will continue to fulfill our mission for years to come. Santa in Prosser – Firefighters dressed as Santa tour Prosser to distribute candy in the community and provide photo ops with Santa. James Wildman Scholarship – benefiting a high school senior going into nursing, firefighting and medical fields.